Public Works — Osborn Pacific Group Inc.
Osborn Pacific Group has worked with public agencies and municipalities in the northwest to plan, design, and mitigate for essential, but not always aesthetic, infrastructure installations. These installations call for some of the most creative design solutions of all. Often a public works facility is located in established residential neighborhoods and the immediate neighbors have legitimate concerns when these facilities expand or remodel. New projects, expansions, or remodels must be sensitive to the local community and require a comprehensive landscaping concept. On many of these projects, Osborn Pacific Group uses green infrastructure management approaches and technologies to incorporate cost-effective, sustainable, and environmentally friendly stormwater treatment. At the largest scale, the preservation and restoration of natural landscape features, such as forests, floodplains and wetlands, are critical components of green stormwater infrastructure. By protecting these ecologically sensitive areas, Osborn Pacific Group can improve water quality while providing wildlife habitat and opportunities for outdoor recreation. On a smaller scale, Osborn Pacific Group green infrastructure practices include rain gardens, porous pavements, green roofs, infiltration planters, trees and tree boxes, and rainwater harvesting for non-potable uses. Rock Creek Wastewater Treatment Pl. Osborn Pacific Group was responsible for landscape architecture and integration of artwork for the renovation and expansion of Barton Pump Station located immediately adjacent to the Fauntleroy Ferry Terminal on Puget Sound. This project also included restoration of an adjoining residential property and design of Fauntleroy Cove Park. Osborn Pacific Group worked closely with the Fauntleroy Neighborhood Association to re-create the community park and beach access. We worked closely with our subconsultant and artist to design and integrate five new major art sculptures and two existing art sculptures. Because this project site lies largely within the shoreline zone, vegetation consists of all native plants. Osborn Pacific Group was a member of the design team responsible for the expansion of this major transit base in Seattle’s SODO neighborhood. This project included the Communications and Control Center (LEED Gold Certified); the Tire and Millwright Shop (LEED Certified): the Operations Building (LEED Gold Certified); renovations to existing maintenance buildings; expanded bus parking; and improvements to Sixth Avenue. OPG was responsible for the landscape master plan for this 22-acre facility, and the design and preparation of multiple sets of permitting and construction documents (landscape planting, irrigation, site furnishings) for this multiple-phased project. More than 20 percent of the project site is vegetated open space designed and planted with native and adapted vegetation. An exterior vegetated wall or “green screen” was designed to provide shading for the west façade of the Operations Building as well as create visual appeal along Sixth Avenue. 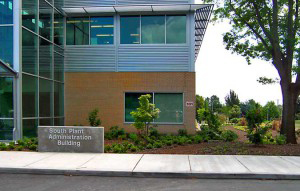 King County constructed a new Administration Building at the South Treatment Plant. The new building occupies the old building footprint, necessitating sensitive preservation of specimen vegetation. Osborn Pacific Group provided site planning, landscape and associated site improvements, including an outdoor employee area, and an irrigation system. Adjacent mature plantings set the standard for providing a complementary palette of fragrant plants. The new sprinkler irrigation system was designed to use the abundant reclaimed water available onsite.